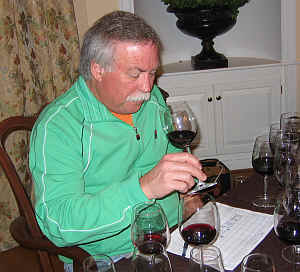 Having tasted an interesting set of Syrahs and Petite Sirahs in our previous tasting, host Tim Zainer put together a flight of North Coast Petite Sirahs. 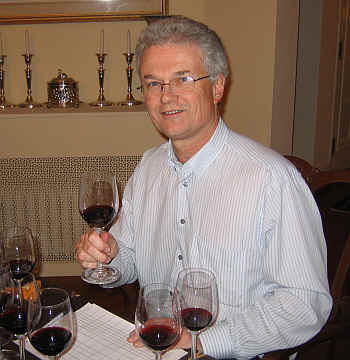 We had predominantly currently-released wines ranging from the 2004 vintage to 2006. 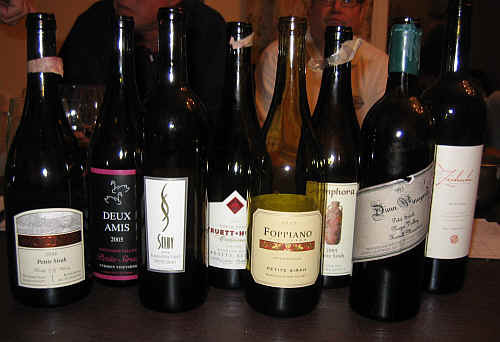 Most of the wines were from Sonoma County fruit and we tasted several appellations in this line-up. One wine finished well ahead of the group. Second place through fifth place were separated by a mere 5 points, so that bunch was within a narrow band of similar quality. 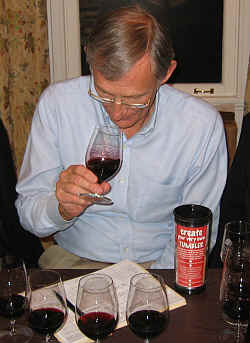 The sixth, seventh and eighth place wines were well behind the pack. Clear in appearance, this was very dark and inky in color, with youthful purple hues. I found nicely berryish fruit with a hint of a floral note. It's somewhat coarse and tannic on the palate, hallmarks of Petite Sirah. It shows some dark fruit tones, but for a wine of such visual intensity and structure, it doesn't quite have the stuffing one might expect. I gave it a one star rating on my three star scale, (no stars being a standard or ordinary wine), but I'd never pay $48 for such a bottle! Randy Dunn purchased a famous old vineyard next to his own Howell Mountain estate vines. 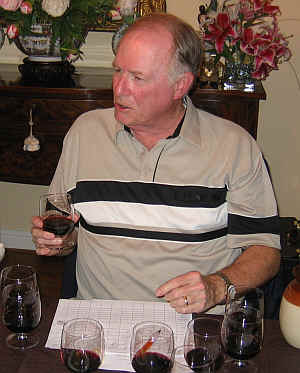 The Park Muscatine vineyard had been the source of Zinfandel made by Ridge Vineyards, for one. 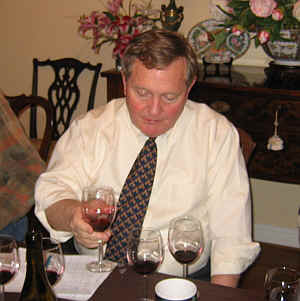 Dunn made Petite Sirah for his own amusement and it was great to have such a venerable, old bottle in this line-up as it was, truly, a mystery wine. Clear in appearance and with a medium ruby, still youthful color, this wine offered very tarry, earthy and old fragrances. It reminded me a bit of old Barolo wines which have a similarly tarry nose. It's dry and nicely acidic, with medium+ body. The tarry element comes through on the palate and this is still tannic and a bit shrill. I gave it no stars as a young vintage of Petite Sirah, but now, seeing it's a 15 year old wine, I'd give it a one star rating. Clear in appearance, this dark colored wine was marred by some funky off-aromas at the start. Perhaps it was some hydrogen sulfide, but there was a slightly stink note to this wine. As it aired, it began to show a more berryish aspect to the aroma. Dry and moderately acidic, this medium-full bodied red wine offered a modest level of fruit on the palate. I was put off by the nose, though, and marked it down for that. No stars. Clear in appearance and showing medium ruby color, Foppiano's Petite Sirah began with lots of berry-like fragrances and dark fruit character. 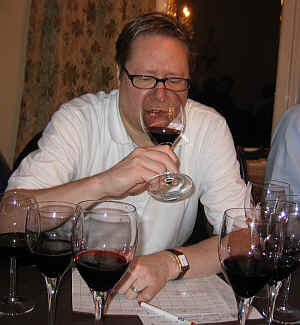 The wine took on a decidedly anise element over the course of the tasting. Medium-full bodied this wine has a bit of heat on the palate, with berryish fruit and a touch of a brown spice note. It's quite drinkable now and it can probably be held several more years. One star. Clear in appearance, this is another deep, dark wine with inky overtones. There's quite a bit of fruit on the nose here with an herbal quality bordering on being resiny. I like the forest-floor notes here, too. It's dry and nicely acidic, with medium-full to full body. 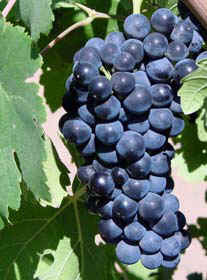 The wine offers lots of ripe fruit on the palate and it's big and robust. Quite good, I thought. It will probably cellar nicely for 5-10 years. One-and-a-half stars. With good clarity and medium+ ruby red color, Selby's wine seemed a bit ripe and heady on the nose. There's a pleasant woodsy aspect to the fragrances with a hint of coconut on display. 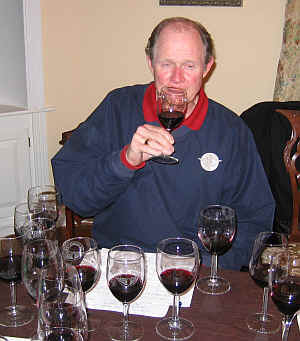 The wine is dry and medium-full bodied. I found it less charming on the palate, striking me as hot, tannic and harsh. It's worthy of a half star to one star rating. Dark in color and with good clarity, this wine shows tons of black fruit aromas and some woody, coconut-like tones on the nose. It's nicely balanced, being dry and having ample acidity. Medium-full bodied, but not heavy, the flavors are reminiscent of raspberries and blackberries with a hint of spice underneath. There's a moderate tannin level...it's quite drinkable today and should remain in good shape for several more years. One-and-a-half stars. Very nice. The run-away winner of this tasting, Mounts is deep and dark in color with youthful purple hues to the robe. It's teeming with blackberry fruit with perhaps a note of cantaloupe, too. It's dry and full-bodied with some of the coarseness we expect in Petite Sirah. The fruit notes are so intense, though, the overall impression is of a balanced, big red. There's nice length to the finish of this wine, as well. Two stars. Bravo! !